I am typing this blog to you from the balcony. The cot here makes a wonderfully comfortable place for me to sit, with a bed pillow for my back against the wall. The little waterfall makes a tinkling sound as the water drops into the pool. The hummingbirds love the new feeder! This feeder features a ring that goes completely around for the birdies to stand on while eating the sweet nectar. The feeder that fell off the balcony had no place for the hummers to stand and they had to fly while feeding. I positioned myself on the cot bed so that I have a clear view of the feeder. Are you surprised to know that a hummingbird comes to the feeder more than once a minute? The impatien flowers growing on the balcony are struggling. I believe it is the temperature here in the City of La Mesa that is putting the impatiens in distress. It seems to me that the thing to do now is to buy six-packs of impatiens and replant all the pots. I am going to clean out the soil from all the pots and replace that soil with Miracle-Gro Potting Mix. That should give the flower garden the boost to life that it needs! 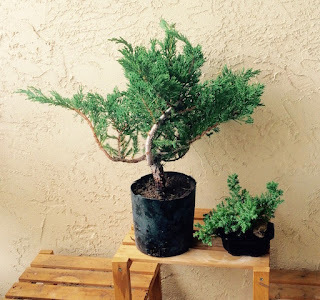 There are now two Bonsai trees growing on the balcony. I have pruned the larger one a bit. It is difficult learning about the art of Bonsai! It's going up to 91° here today. But that temperature is not bad for San Diego County, "if you keep out of the Sun." I feel really lucky to be in my 79th year and still be in pretty good shape. However, my current illness, neurological problem with my right hand, could be a ball-buster. My balcony, which faces north, is in the shade until after 4pm. Sun flowering plants do not do well here. I have a couple of artificial lights here for the Bonsai trees. Geraniums and petunias can tolerate heat and sun quite well. They both come in several colors and in trailing varieties too. During the summer months, here on my balcony, there is about 3-hours of Sun each day. For other parts of the year, the Sun is hardly here at all. Weather dependent plants take a lot of effort. But they are lovely.